The newest addition to Southco’s R4 Series features a compact design and multiple points of actuation. These robust latching solutions for doors and panels of heavy-duty equipment and vehicles combine rotary-action security with push-to-close convenience. Their compact design provides concealed operation, while tolerating misalignment on closing, engaging easily with low closing force, and latching firmly with a snug, secure fit. Durable materials, corrosion-resistant plating, and robust construction make these latches suitable for demanding environments. 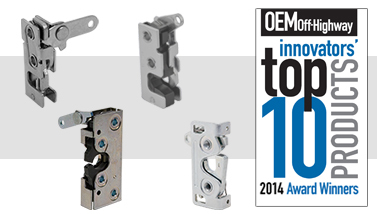 Easy operating mechanism and versatile actuation options make latches easy to adapt to a variety of installations.